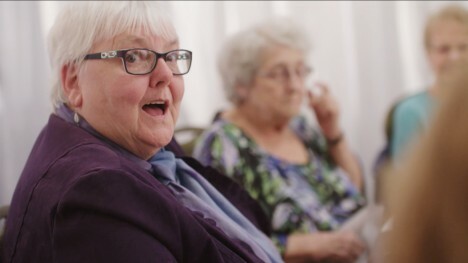 Enbridge Gas New Brunswick unveiled a heartwarming new video today showing how real-life moms at a Moncton retirement home were honoured with the ultimate Mother’s Day surprise. Filmed under the guise of a documentary on motherhood, nine women from the home shared touching stories from their lifelong roles as mothers, only to be shocked in an emotional hidden camera moment as their families (65 people in all) rush out to greet them for a mother’s day dinner surprise – having been secretly brought in from around the country. The 3-minute spot was filmed at Moncton Residence, and features the stories of nine elderly moms. Eight cameras captured the unveiling of their families, who flew in from as far away as Whitehorse and North Bay to be part of the surprise.